One of the giants of the alto saxophone, Johnny Hodges was perhaps the most important soloist and sideman in Duke Ellington's orchestra from 1928 up to Hodges' death in 1970. The self-taught player made many solo forays during his long career - one of his '50s outfits included a young John Coltrane - but history remembers Hodges for his virtuosic sidemanship, particularly his sensitive rendering of ballads. I have many of the 45 reissues and this one made me take notice. This has become one of my showcase albums with excellent dynamics and silent backgrounds. 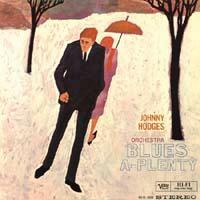 A classic album by Mr. Hodges that has never sounded better. Thank you Chad and Co.